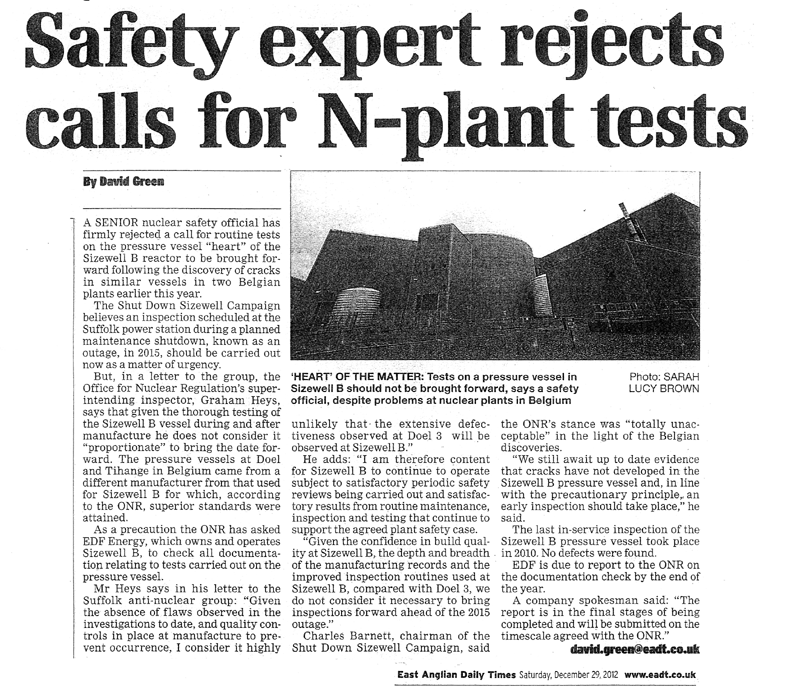 Readers of Our News 182 (November 2012) will recall that we wrote to the Director of the Office of Nuclear Regulation (ONR) expressing Our grave concerns over the possibility Of cracks in the Sizewell B Reactor Pressure Vessel (RPV) which, if present, could lead to a catastrophic release of highly dangerous and widely spread radiation. We demanded an immediate shut down and physical testing of the RPV, The ONR, in a letter dated 26 November, confirmed its negative response (see above) and also sent it to the Chair of the Sizewell Stakeholder Group (SSG). We wrote to the SSG urging them to support us in Our demand to the ONR that as a matter of urgent safety, they should not wait for disclosure of documentation covering the manufacture and periodic past tests of the Sizewell B RPV, but press for an immediate inspection and, more importantly, physical testing Of it. It will not do for the ONR (our so-called safety watchdog) to leave the physical inspection of the RPV until the next 10 year Periodic Safety Review, due in 2015, three years hence, as already decided, even before EDF have furnished the ONR with the asked-for paperwork, T precautionary principle requires immediate action now, It is pertinent to recall that the previous director of Sizewell B, the late Brian Dowds, said in an article in the EADT: ‘Sizewell B is a dangerous animal, but we have got it tamed’. But have they?